Educated at Stonyhurst College, Terry Cave was granted an Emergency Commission in 2nd Gurkhas of the Indian Army in 1943 and transferred to The Royal Leicestershire Regiment on 8.6.1946. He served in 1st Bn in UK as Mortar Platoon Commander, and as Intelligence Officer in Hong Kong. Promoted Captain on 25.9.1950. In Feb 1951 he qualified as an Interpreter in Hungarian, and passed his First Class exam in September. He then served with British Troops Austria in the interpreter…s pool, returning to 1st Bn in 1953 in Germany as Mortar Platoon Commander, and played rugby for the Bn. He served as Adjutant in 1953-54, and transferred to the Intelligence Corps in 1955. He was Military Attaché in Budapest 1962-65. He commanded Intelligence & Security Group (BAOR) 1968-70, followed by Chief Instructor of the Intelligence Corps Centre at Ashford. Awarded the C.B.E. for his work as Defence Attaché Prague 1971-73 (L.G. 12.6.1974). Retired from the Army in 1976, and worked as an RO in the Defence Intelligence Staff. He lived in Worthing, and his long service to the Roman Catholic parish there was recognised by the award of the Papal …Bene Meriti‘ medal, the Holy See‘s equivalent of the O.B.E. He was Patron of the Western Front Association. He died in 2015, aged 91 years. Son of Lt Col A C Cave of the Regiment. 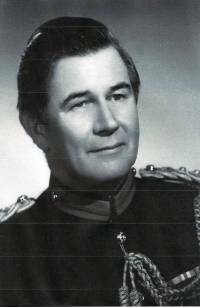 Do you have more information about Colonel Terence Arthur Cave - CBE ? If you have any further information or photos regarding Colonel Terence Arthur Cave - CBE that you believe we could publish, please click here to contact us.